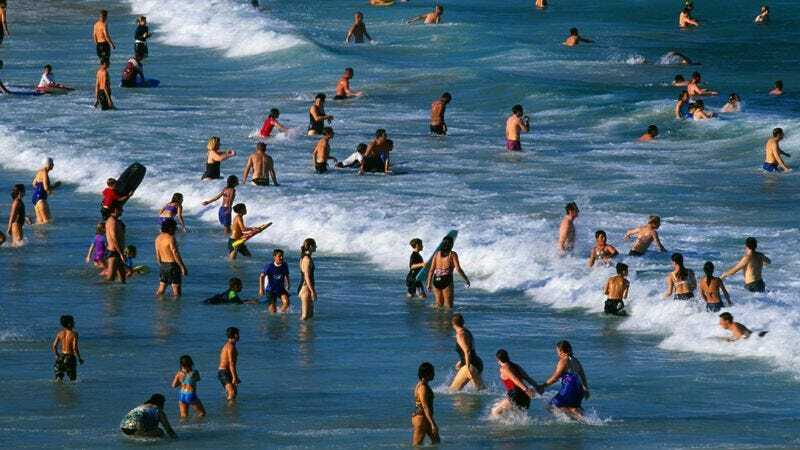 SILVER SPRING, MD—Scientists at the National Oceanic and Atmospheric Administration sounded a strong warning about rising seas Monday, saying that ocean levels around the world are projected to increase by 12 inches or more should a bunch of people go swimming at the same time. “According to our latest analysis, an increase in global mean sea level of several inches is inevitable at this point given the approach of summer beach season, when millions of people will simultaneously go for a swim,” said oceanographer Paul Acosta at a press conference, adding that the increase could be “significantly higher” than currently predicted if lots of beachgoers choose to hold their breath and go under all the way. “Coastal cities and low-lying islands are the most vulnerable to rising sea levels, particularly if it’s not just kids who go for a dip, but full-grown adults as well. Our best hope now is moderating the rise as much as we can by convincing people to only wade in up to their waists.” Acosta also warned about the devastating possibilities of catastrophic tsunamis should everyone jump into the ocean together from a dock or off the side of a boat.